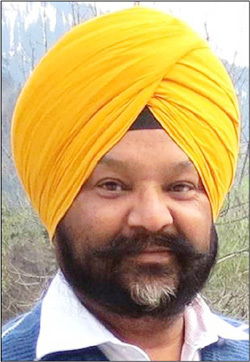 Dr. Bal is the son of Late Bibi Pritam Kaur and Late S. Santa Singh ji Bal. He got his earlier education at Village Bal Kalan; and Govt. Senior Secondary School Town Hall Amritsar, followed by higher education at the DAV College Amritsar (Punjab University Chandigarh). He passed his Medical Graduation (MBBS) at Govt. Medical College Amritsar, 1971-1976 batch under Guru Nanak Dev University, then Post graduation: (MD Pathology) from Govt. Medical College, (GNDU) Amritsar. He remained in Govt. Job from 1st January, 1978 to March 31, 2015. Dr. Bal spent first 6 years of his service in Border Area of Amritsar (Bhikhiwind, Chhina Bidhi Chand, Panjwar, Kasel, Jhabal, Gandiwind) + six months at civil hospital Jalandhar. On 01-01-1984, je joined deptt of Pathbology bat Medivcal College Amritsar, worked on different designations/postions aand then worked iat Medical colleges Faridkot and Patiala, at various positions. He joined GMC Patiala one 10-8-1998 as Prof. & Head, Pathology at GMC, Patiala and retired from this college in March 2015, with total Government Job of 37 years and 3 months. Experience as forensic pathologist: since: 31 Years. 3. “Silver jubilee of pen friendship” (Non-medical). 4. Dabbian wala khes (ਡੱਬੀਆਂ ਵਾਲਾ ਖੇਸ) (25 stories) in Punjabi language. 1. Conference of North West Chapter of Indian Assoc. of Pathologists & microbiologists, April 1997, at GMC, Amritsar. 2. Conference of North West Chapter of Indian Assoc. of Pathologists & microbiologists, April 11, 1999 at GMC, Patiala. 3. Workshop of International Academy of Pathology – Indian Division (IAP-ID), April 18, 2003. at GMC Patiala. 7. Conf of Indian Assoc of Pathologists (APCON 2011), Dec. 2011. 17. Safdar Jung Hospital Guru Gobind Singh Inderprast University New Delhi. 8. Chairman of MD/MS, Thesis Scrutiny Committee (Surgical Group), GMC, Patiala. 9. Chairman of Counseling for MBBS admissions at Baba Farid Univ, of Health Sciences Faridkot. 10. Chairman/Dean of Meeting of Faculty of Medical Sciences at Baba Farid Univ, of Health Sciences Faridkot. 11. Punjabi Sahit Sabha Patiala. 14. Hindi Bhasha Sammelan Patiala. 15. Gyandeep Sahit Sadhna Manch Patiala. 17. 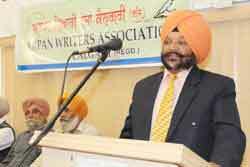 Patiala Saaz aur Awaz cultural forum (Vice president). Pakistan -Lahore, Nankana Sahib, Hasna Abdal, Rawalpindi. 1. Development of an atlas of cancer in Punjab under National Cancer Registry Program (ICMR-WHO). 4. Surmaee Sham –Musical evening - At Gymkhana club Patiala. Based on my story, a film “Musarrat Sarhaddon Paar” has been produced. 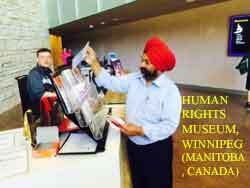 The Film has Dr. Manjit Singh Bal’s own lyrics, story, dialogues, music, a small role and editing. 2. National Dalit Sahit Academy Delhi. 3. Fellow, Punjabi University, Patiala. Music, singing, can play flute - a music CD on Flute, Tunes of old Indian film songs instrumental. Photography, Story poem writing, Health articles in National & International Punjabi dailies and journals, academic & scientific articles. 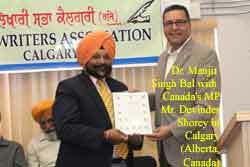 Mehtab-Ud-Din has produced a short film on Dr. Manjit Singh Bal; it is available on YouTube. You can see it here.